Objective: Major sand storms are frequent in the Middle East. This study aims to investigate the role of air particulate matter (PM) level in acute asthma in children in Riyadh, Saudi Arabia. Methods: An aerosol spectrometer was used to evaluate PM < 10μm in diameter (PM 10 ) and PM < 2.5 μm in diameter (PM 2.5 ) concentrations in the air every 30 minutes throughout February and March 2012 in Riyadh. Data on children 2-12 years of age presenting to the emergency department of a major children's hospital with acute asthma during the same period were collected including their acute asthma severity score. Results: The median with interquartile range (IQR) levels of PM 10 and PM 2.5 were 454 μg/m 3 (309,864) and 108 μg/m 3 (72,192) respectively. There was no correlation between the average daily PM 10 levels and the average number of children presenting with acute asthma per day (r = -0.14, P = 0.45), their daily asthma score (r = 0.014, P = 0.94), or admission rate ( r= -0.08, P = 0.65). This was also true for average daily PM 2.5 levels. In addition, there was no difference in these variables between days with PM 10 >1000 μg/m 3 , representing major sand storms, plus the following 5 days and other days with PM 10 < 1000 μg/m 3 . Conclusion: Sand storms, even major ones, had no significant impact on acute asthma exacerbations in children in Riyadh, Saudi Arabia. The very high levels of PM, however, deserve further studying especially of their long-term effects. Major Sand storms are frequent in the Middle East , and the Arabian Peninsula is the second main source of sand storms in the world after the Saharan desert in Africa. Recently, the average monthly deposition of dust in Riyadh City, Saudi Arabia was estimated to be 42.09 tons/km 2. It is a common public and media perception in many Middle Eastern countries that asthmatic patients are at very high risk of developing acute exacerbations during these sand storms. This may lead to increased rate of absence from work or school. However, literature addressing this problem in the Middle East is very scarce and as far as we know this risk has not been evaluated scientifically in the local environment. In this study we aim to investigate the correlation between the level of PM concentration in the air and the rate of emergency department (ED) visits or hospital admissions of children with acute asthma in Riyadh city. The concentrations of PM 10 and PM 2.5 were measured using a Grimm Environmental Dust Monitor (EDM) 365 aerosol spectrometer (Grimm Aerosol Technik GmbH, Ainring, Germany). The device [Figure 1]a, b, an optical particle counter (OPC), is an instrument for real-time measurement of particulate matter using laser-light-scattering technology. Air containing multiple particle sizes passes through a flat laser beam produced by a precisely focused laser and several collimator lenses. The scattered light is then detected by a 15-channel pulse-height analyzer for size classification. The data is subsequently presented as PM 10 and PM 2.5 . This instrument can run for long periods without specific supervision. The readings were taken every 30 minutes during February and March 2012, a period of frequent sand storms. The validity of the measurements performed by the instrument has already been established. The aerosol spectrometer was installed at King Khalid International Airport in Riyadh, which is located just north to the city away from heavy traffic and any industrial establishment or factories. Figure 1: a. General outside view of the GRIMM EDM 365 Environmental dust monitor fixed near King Khalid International Airport in Riyadh. b. Open view of the GRIMM EDM 365 Environmental dust monitor. Children 2-12 years of age who presented to the ED with acute asthma during February and March 2012 were included. Information on those patients was collected as part of a clinical trial. Children were considered asthmatic if they were prediagnosed by a physician or had a previous episode of shortness of breath that responded to a β2-agonist. A well-validated acute asthma clinical severity scoring system, with a score range from 5-15, where 15 is the most severe, was used to classify the severity of the attack. The asthma score was composed of five different variables: respiratory rate, oxygen saturation, auscultation findings, retractions, and dyspnea. The hospital's institutional review board (IRB) approved the study. Arithmetic mean of patient's asthma score and frequencies of screening and admission were computed for each day of the month to create a summarized daily record of the above mentioned variables and was merged to the daily records of PM 10 and PM 2.5 data in February and March 2012. Daily record was considered as a unit of analysis. Normality of the variables was assessed using Shapiro-Wilk test. Median and interquartile range (IQR) of the variables was computed for each group of days. Spearman correlation coefficient was used to assess association of the average daily PM 10 , PM 2.5 , and (PM 10 -PM 2.5 ) level with the average daily asthma score, number of patients screened, or admitted. Based on published literature , , two groups of days were defined; days with average PM 10 > 1000 μg/m 3 plus the following 5 days (representing major sand storms) and days with average PM 10 < 1000 μg/m 3 . Average daily asthma score as well as the number of patients screened or admitted were compared between the two groups using non-parametric (Mann-Whitney U) test. Statistical software Stata version 12 (StataCorp, Texas) was used for all statistical analyses. The level of dust density was recorded every 30 minutes throughout the study period. The maximum level of PM 10 recorded was 7873 μg/m 3 on February 2 nd with an average level on that day of 2215 μg/m 3 and the minimum was 35 μg/m 3 on February 5 th with an average level on that day of 132 μg/m 3 . The maximum level of PM 2.5 recorded was 2160 μg/m 3 with an average day level of 554 μg/m 3 and the minimum was 7 μg/m 3 with an average day level of 28 μg/m 3 on the same days as for PM 10 respectively. [Figure 2] shows the average daily recordings of PM 10 and PM 2.5 throughout the study period. There was almost perfect correlation between the levels of coarse particulate matter (PM 10 - PM 2.5 ) and the levels of the fine particulate matter (PM 2.5 ) on the same time points (r = 0.98, P < 0.0001). Overall, the median (IQR) levels of PM 10 , PM 10 - PM 2.5 , and PM 2.5 were 454 μg/m 3 (309,864), 352 μg/m 3 (222,634), and 108 μg/m 3 (72,192) respectively. The mean PM 2.5 /PM 10 ratio during the entire study period was 0.25. Figure 2: Average daily recordings of PM10 and PM2.5 during February and March, 2012. The recordings of March 5,6, 25, and 26 were not available. There was no correlation between the daily PM 10 level and the number of children presenting with acute asthma (r = -0.14, P = 0.45) [Figure 3]. 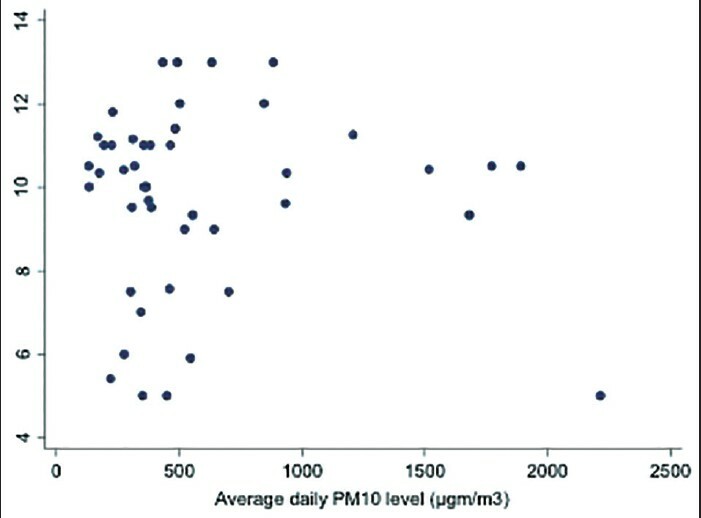 There was also no correlation between the daily PM 10 level and the asthma scores of patients presenting in the same day (r = 0.014, P = 0.94) [Figure 4]. Moreover, there was no correlation between the PM 10 level and the number of asthmatic children admitted per day (r = -0.08, P = 0.65). The same was true for the coarse (PM 10 -PM 2.5 ) and fine (PM 2.5 ) particulate matter levels (data are not shown). 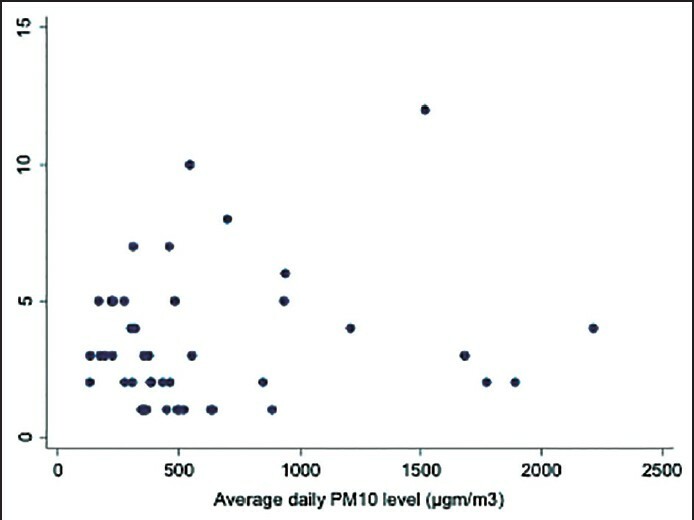 Figure 3: Correlation between average daily PM10 level and the average number of children presenting to the emergency department with acute asthma (y-axis). Figure 4: Correlation between average daily PM10 level and the average daily asthma score of children presenting to the emergency department with acute asthma (y-axis). When comparing the days with very high dust density (PM 10 > 1000 μg/m 3 )  plus the following 5 days and the other days with PM 10 < 1000 μg/m 3 , there was no difference between the number of acute asthma cases seen per day in the ED, their asthma score, or the number of patients admitted per day between both groups [Table 1]. 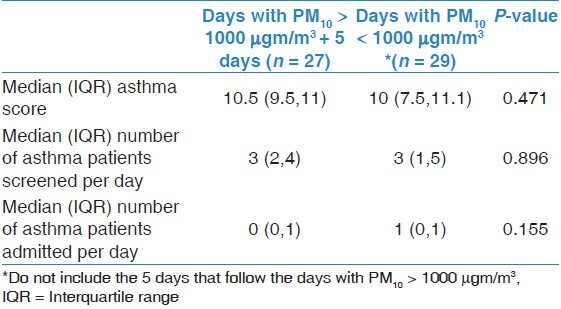 Table 1: Comparison between days with PM10 > 1000 μ gm/m3 and the following 5 days with other days during the study period in relation to different clinical variables. Our findings indicate that there is no effect of sand storms, even heavy ones on the incidence or hospital admissions of acute asthma in children regardless of the severity of the exacerbation. This is contrary to the common public belief locally that sand storms lead to asthma exacerbation. We attempted to measure peak expiratory flow rate (PEFR) in our patients as another marker of respiratory function, but the vast majority failed to do the test appropriately. The very wide variation between the sequential daily PM concentration measurements that is sometimes observed within only few days probably reflects the pattern of sand storms that may come suddenly and fade quickly. In addition, the average PM 10 and PM 2.5 levels recorded in this study are higher than the average levels reported from previous studies in the Middle East , , which are already much higher than the average levels in many other regions in the world. Although the very high PM levels reported in our study were not associated with asthma exacerbations, their long-term effects should be thoroughly investigated. Many large-scale studies have demonstrated that PM air pollution above standard levels is associated with increased morbidity and mortality from respiratory and cardiovascular diseases in the long-term and more markedly with fine PM as compared to coarse PM. ,, More relevant to patients with asthma, the levels of PM, especially fine PM correlated more with bronchial inflammatory markers upregulation including exhaled NO and different inflammatory cytokines as well as aggravation of mild respiratory tract symptoms like cough or causing mild drop in PEFR. ,,,, The US National Ambient Air Quality Standards (NAAQS) maximum accepted level for 24-hour PM 2.5 is 35 μg/m 3 and for 24-hour PM 10 is 150 μg/m 3 . The annual maximum accepted levels for PM 2.5 and PM 10 were 12 μg/m 3 and 50 μg/m 3 respectively. These levels are much lower than our median values of PM 2.5 and PM 10 . Our study may be limited by the lack of information on specific metal particles (like iron, silica, cadmium, or aluminium) concentration in the air or ionic particles (like SO 2 or NO 2 ) that were shown to have significant effect on pulmonary function in some studies ,,, . In addition, this is a single center study, which may limit data generalizability. With the low effect size of stand storms on acute asthma, as implied by the very low correlation coefficient, it seems unlikely to observe positive correlation with higher patient number. Utilizing multiple clinical centers as well as using multiple sites for recording PM density for longer periods of time should, nevertheless, provide more information and may still detect more subtle effects of sand storms on acute asthma. In conclusion, our findings suggest that there is no need for an alarm to be raised in emergency rooms in the event of a sand storm because of fear of overcrowding by patients with asthma exacerbations. On the other hand, the very high levels of fine and coarse particulate matter call for further studies especially on their long-term effects. We would like to thank Prof. Muslim Alsaadi for his advice and review of the manuscript. This study was supported by a grant from the Strategic Technologies Program of the National Plan for Science, Technology, and Innovation (NPSTI) in the Kingdom of Saudi Arabia. Grant number is 08-MED520-02. Fanta CH. Asthma. N Engl J Med 2009;360:1002-14. Tsai CL, Lee WY, Hanania NA, Camargo CA Jr. Age-related differences in clinical outcomes for acute asthma in the United States, 2006-2008. J Allergy Clin Immunol 2012;129:1252-8. Subbarao P, Mandhane PJ, Sears MR. Asthma: Epidemiology, etiology and risk factors. CMAJ. 2009;181(9):E181-90. Monteil MA. Saharan dust clouds and human health in the English-speaking Caribbean: What we know and don′t know. Environ Geochem Health 2008;30:339-43. Modaihsh AS, Mahjoub MO. Falling dust characteristics in Riyadh city, Saudi Arabia during winter months. APCBEES Procedia 2013;5:50-8. Kanatani KT, Ito I, Al-Delaimy WK, Adachi Y, Mathews WC, Ramsdell JW, et al. Desert dust exposure is associated with increased risk of asthma hospitalization in children. Am J Resp Crit Care Med 2010;182:1475-81. Andersen ZJ, Wahlin P, Raaschou-Nielsen O, Ketzel M, Scheike T, Loft S. Size distribution and total number concentration of ultrafine and accumulation mode particles and hospital admissions in children and the elderly in Copenhagen, Denmark. Occup Environ Med 2008;65:458-66. Gupta P, Singh S, Kumar S, Choudhary M, Singh V. Effect of dust aerosol in patients with asthma. J Asthma 2012;49:134-8. Park JW, Lim YH, Kyung SY, An CH, Lee SP, Jeong SH, et al. Effects of ambient particulate matter on peak expiratory flow rates and respiratory symptoms of asthmatics during Asian dust periods in Korea. Respirology 2005;10:470-6. Schwartz J, Neas LM. Fine particles are more strongly associated than coarse particles with acute respiratory health effects in schoolchildren. Epidemiology 2000;11:6-10. Nikasinovic L, Just J, Sahraoui F, Seta N, Grimfeld A, Momas I. Nasal inflammation and personal exposure to fine particles PM2.5 in asthmatic children. J Allergy Clin Immunol 2006;117:1382-8. Shahsavani A, Naddafi K, Jaafarzadeh Haghighifard N, Mesdaghinia A, Yunesian M, Nabizadeh R, et al. Characterization of ionic composition of TSP and PM10 during the Middle Eastern Dust (MED) storms in Ahvaz, Iran. Environ Monit Assess 2012;184:6683-92. Draxler R, Gillette D, Kirkpatrick J, Heller J. Estimating PM10 air concentrations from dust storms in Iraq, Kuwait and Saudi Arabia. Atmos Environ 2001;35:4315-30. De Longueville F, Hountondji YC, Henry S, Ozer P. What do we know about effects of desert dust on air quality and human health in West Africa compared to other regions? Sci Total Environ 2010;409:1-8. Burkart J, Steiner G, Reischl G, Moshammer H, Neuberger M, Hitzenberger R. Characterizing the performance of two optical particle counters (Grimm OPC1.108 and OPC1.109) under urban aerosol conditions. J Aerosol Sci 2010;41:953-62. Alangari AA, Malhis N, Mubasher M, Al-Ghamedi N, Al-Tannir M, Riaz M, et al. Budesonide nebulization added to systemic prednisolone in the treatment of acute asthma in children: Double-blind, randomized, controlled trial. Chest 2014;145:772-8. Qureshi F, Pestian J, Davis P, Zaritsky A. Effect of nebulized ipratropium on the hospitalization rates of children with asthma. N Engl J Med 1998;339:1030-5.
de Longueville F, Ozer P, Doumbia S, Henry S. Desert dust impacts on human health: An alarming worldwide reality and a need for studies in West Africa. Int J Biometeorol 2013;57:1-19. Hefflin BJ, Jalaludin B, McClure E, Cobb N, Johnson CA, Jecha L, et al. Surveillance for dust storms and respiratory diseases in Washington State, 1991. Arch Environ Health 1994;49:170-4. Watanabe M, Yamasaki A, Burioka N, Kurai J, Yoneda K, Yoshida A, et al. Correlation between Asian dust storms and worsening asthma in Western Japan. Allergol Int 2011;60:267-75. Yang CY, Tsai SS, Chang CC, Ho SC. Effects of Asian dust storm events on daily admissions for asthma in Taipei, Taiwan. Inhal Toxicol 2005;17:817-21. Yang CY, Chen CC, Chen CY, Kuo HW. Air pollution and hospital admissions for asthma in a subtropical city: Taipei, Taiwan. J Toxicol Environ Health 2007;70:111-7. Bell ML, Levy JK, Lin Z. The effect of sandstorms and air pollution on cause-specific hospital admissions in Taipei, Taiwan. Occup Environ Med 2008;65:104-11. Pope CA 3rd, Dockery DW. Health effects of fine particulate air pollution: Lines that connect. J Air Waste Manag Assoc 2006;56:709-42. Davidson CI, Phalen RF, Solomon PA. Airborn particulate matter and human health: A review. Aerosol Sci Technol 2005;39:737-49. Chien LC, Yang CH, Yu HL. Estimated effects of asian dust storms on spatiotemporal distributions of clinic visits for respiratory diseases in taipei children (taiwan). Environ Health Perspect 2012;120:1215-20. National Ambient Air Quality Standards for Particulate Matter [Internet]. Environmental Protection Agency, Wshington, DC. 2013 January 15. Available from: http://www.gpo.gov/fdsys/pkg/FR-2013-01-15/pdf/2012-30946.pdf [Last accessed on 2013 Dec 15]. Schaumann F, Borm PJ, Herbrich A, Knoch J, Pitz M, Schins RP, et al. Metal-rich ambient particles (particulate matter 2.5) cause airway inflammation in healthy subjects. Am J Resp Crit Care Med 2004;170:898-903.